I can think of exactly two times when the word urn is used: as a container for someone’s ashes, and as a container for colored balls. Since I’ve never physically seen an urn that has balls in it, it makes me wonder – when did that become such a standard in probability problems? Why are the balls in an urn in the first place? When I asked that very question, TwoPi mentioned “surmounted” as another example of an English word that seems to be used exclusively in one context: to describe Norman Windows (a window in the shape of a rectangle surmounted by a semicircle). “surmountable” is more common, and “insurmountable” even more so, so I suppose “surmounted” does actually appear in a related context (as in “that difficulty has been surmounted”), but it’s still relatively unusual. I suspect that there are other words, English words as opposed to mathematical terms, that just don’t show up very often outside of the exercises in a text. Here is a Norman Window, by the way, from Notre-Dame d’Étretat in Étretat, France. I hope…I mean, I know my students aren’t doing anything like this during class. Right? I *meant* to get another post up on Multiplication today, but wasn’t able to start finish that. Instead, here are some punctuation puzzles! Nelson Rich, my first department chair, sent this along to me about ten years ago. It turns out it’s over 60 years old, and was first used in 1947 by Hans Reichenbach. While looking this up (I couldn’t remember how many “had”s there were, I discovered two similar problems. Add punctuation to the following sentence so that it is clear what is means. (It is supposedly correct as written, although some extra words seem to be implied.) It was first used in 1972 by William J. Rapaport who is a prof at the University of…you guessed it…Buffalo. Wasn’t that one fun? It dates back to 1953, to Brewer’s Dictionary of Phrase and Fable by Ebenezer Cobham Brewer. The stature of books, published under the GNU-FDL by Lienhard Shultz, is part of the Walk of Ideas of Berlin-Mitte. Last August, Ξ and I were inspired by a post about the International Radiotelephony Spelling Alphabet at our favorite non-math blog, puntabulous, to create a satirical version, one that would be completely confusing and virtually useless. We posted a preliminary version of this to the comments of that original post. Since then, the list has evolved, with help from our fellow commentator friends at puntabulous, as well as help from Batman, NP, and several other of Ξ’s coworkers. What follows is the fruit of that community effort. Note: As with the Official version, this is meant to be read aloud. I have a distinct memory of a specific moment in childhood, sitting in a second grade classroom, when I realized that dictionaries are inherently circular. I can open the dictionary to see a description of the meaning of the word “proponent”, and read “one who argues in favor of something”. But then if this is to truly provide meaning for the word “proponent”, I need to also know the meanings of these seven other words. Each of which I can look up in this same dictionary, and find their respective meanings described in terms of myriad other English words. Sadly, this process never ceases. In order for English words to have meaning by this process, one needs to know the meanings of some core set of words, some basis, in terms of which all other English words can be described. So languages, and dictionaries in particular, are kind of like axiomatic systems. We start with basic terms or axioms, whose meaning we know, whose truth we assume. From this ad hoc starting point, we can build structure and meaning, but fundamentally the meaning of any particular thing reduces down to reference to our starting axioms, our undefinable terms. I have questions. And I don’t know enough about computational linguistics to even know how to ask them appropriately, or where to look for possible answers. What is the smallest possible basis for this graph? How many English words must I know in order to be able to look up and understand the meaning of any other word in the dictionary? Are there reasonably efficient algorithms for generating the smallest possible basis V? Is this something I could be doing for fun on a PC running Matlab? Or is this something so unreasonably complex that I’d need something much more powerful to take it on? Apart from personal curiosity, it seems that the size of such a minimal basis might be used to measure the quality of a dictionary: can the authors describe everything in terms of a relatively small basic vocabulary? The image Dictionaryindents.jpg was photographed by Thegreenj and posted to Wikipedia under the GNU Free Documentation License (v 1.2 or later). What’s a seven letter word for “seven letter word”? ANSWER: This often is seen when the sun shines following a rain storm. Question: What is a “rainbow”? As I was reading through the questions in this category, my brain started anticipating “A word meaning `seven letter word'”. Offhand, I didn’t know of a word meaning “seven letter word”. For that matter, I couldn’t immediately think of any words that meant “a word with n letters”, for any particular value of n.
But if such words existed… clearly, a word meaning “one letter word” would have more than one letter in it, since we can easily enumerate all the one letter words in English, and check their meanings. And it seemed pretty likely that a word meaning “one hundred letter word” would have fewer than 100 letters. AH HA! I thought, for a fleeting moment… if such names start off too long, and eventually are too short, then somewhere in between they must be just right…, until I realized that there was no expectation of continuity, that any putative function for which f(n) = “the number of letters in a word meaning ‘word with n letters'” would map the natural numbers into the natural numbers, and so the intermediate value theorem need not hold. In English, the word “four” has 4 letters. A bit of thought is perhaps enough to convince you that no other english word could use the same number of letters as the word it represents. What would a proof of that look like? What happens in other languages? Are there languages where more than one word uses “its” number of letters? Are there languages where there are no such coincidences? A far more general linguistic/logic topic: adjectives that apply to themselves. “Short”, or “polysyllabic”, or “English”. Perhaps “ostentatious”, or “unabbreviated”. Does “mispelled” count? But then what of “Nonselfapplicable”? Does it apply to itself? Is “nonselfapplicable’ a nonselfapplicable word? From now on, I will always associate Goldilocks and the Three Bears with the intermediate value theorem. Dr Pagel’s work has shown that the pace at which words evolved depends on how they are used. Numerals are the slowest to change, followed by pronouns, probably because they are used extremely often and have a very precise and important meaning. Nouns evolve more slowly than verbs, and verbs evolve more slowly than adjectives. Words that are used less frequently evolve more quickly than those that are common. The number One is a pretty old word (although apparently it used to be pronounced with a hard o, like only, and only started sounding like “won” about 600 years ago). Two ,Three, Five, I, and Who are even older, though not much much [and by “old” they’re talking about thousands, if not tens of thousands, of years]. The number word Four, however, evolved much more recently. I find that last fact rather intriguing, but my searching skills are failing me in learning more about that; perhaps it has something to do with the fact that four doesn’t sound anything like the Latin quattuor or the Greek tessares. This research also suggests which words will eventually disappear from English. One leading contender is “dirty”, because there are a lot of unrelated words across the Ind0-European languages that mean the same thing. Not surprisingly, no numbers were slated for disappearance. Yesterday I referred to some Linguistic problems that could be solved just like mathematical puzzles, by finding patterns. I was talking to Batman at work today and it turns out that there is a whole Olympiad dedicated to puzzles just like that! Yes, it’s the International Olympiad in Linguistics, aimed at high school students, and you don’t have to be multilingual to enter. The most recent one was the 6th Annual IOL, which took place in Bulgaria August 4-9, 2008. You can find links to the 2008 problems and solutions (in 9 different languages) on this page. There are five individual problems [worked on in a 6-hour time block] and one team problem. 19. The shaman hurt you. 20. The teacher saw the boy. 22. You shot a dog. 23. Your dog hurt a teacher. Sadly, registration for NACLO 2009 [the North American Computational Linguistics Olympiad, which is the preliminary contest for North Americans hoping to go to the International contest] closed just a few weeks ago, on February 3. That site, however, has a page of links to other practice problems and solutions, so you can still work on these at home. The Babylonian problem is very much like one I do in the first week of the semester in a Math for Liberal Arts class, and many of the others are similar in tone to the problem quoted above and in yesterday’s post. Map showing Bulgaria posted by Rei-artur under the GNU-Free documentation license. I’m totally stealing today’s post from another blog. But I feel OK about that because One, if I don’t do that then there won’t be a post today at all, and Two, it’s a really neat post. atakupenda — He will love you. nitawapiga — I will beat them. atatupenda — He will love us. anakupiga — He beats you. nitampenda — I will love him. unawasumbua — You annoy them. There’ a lot about linguistics that I find fascinating, and I really enjoyed reading these different puzzles (and I’m totally giving them to the seniors in my Problem Solving class this week). Photo of Pater Noster in Kiswahili published here under the GNU FDL. There’s a web site Gender Analyzer that looks at a blog site and decides if it was written by a man or a woman. And by “decides” I means uses an algorithm. On a whim I checked 360. It said it was written by a man. OK, that was a freebie because we have multiple authors so either answer could be viewed as correct. Then I started checking other math sites. 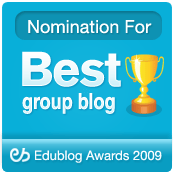 Teaching College Math Technology? Written by a man. (Surprise, Maria!) Let’s Play Math? Written by a man. (Surprise, Denise!). Continuities? Written by a man. (Surprise, Jackie!) Math Trek? Written by a man. (Surprise, Julie!) Every math blog I tried was claimed to be written by a man, no matter who it was written by. And no, it doesn’t only pick men – non-math blogs are claimed to be written by either women or men. OK, it’s just an algorithm. And it was just written for fun, not for any scientific claim, so I can respect that. And it doesn’t claim to be super-accurate — indeed, they publish a little poll at the side asking if they were correct and it’s only accurate 56% of the time. But still, the whole math=man connection in the algorithm is bugging me, probably more than it ought. I’d feel better with equal inaccuracy by gender. Yesterday’s post was about how Pole Vault conversion between Metric and Imperial is not symmetric: 16′ 1″ converts to 4.90 meters, but 4.90 meters only converts to 16′ 3/4″. It turns out that language translation programs aren’t symmetric either. For example, Babel Fish translates the phrase Gozilla sure eats a lot of Snickers bars! 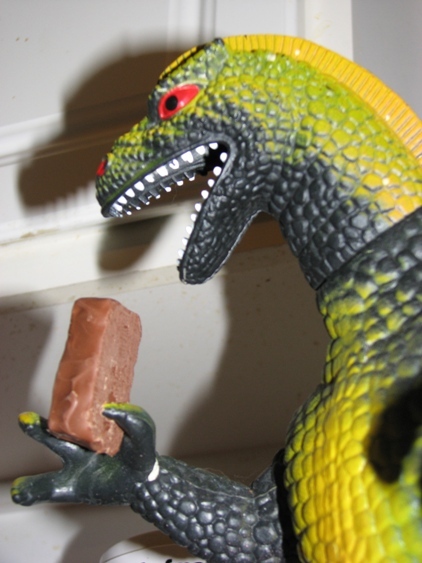 as Godzilla mange sure beaucoup de barres de Snickers! in French, but then if you translate the French phrase back into English you get Godzilla eats sour much bars of Snickers! Sour (surely?) Snickers — bleh. Godzilla can have ’em. Google’s translation were – unfortunately for the purpose of this – far too good to be funny most of the times, even when trying multi-language chains (e.g. English to Japanese to German to English). There’s more of this on The Language Log and also on The Lansey Brother’s Blog (using the Gettysburg Address). Ah, Garfield. Providing amusement on so many levels. My cousin Taimi is a linguist, and at our Big Family Reunion last month she told me that some people tried to develop a mathematical symbolism for language (language in general, regardless of the actual language spoken) and it worked well for speech that was meant to be informative. For speech patterns that were social and culturally based, though (when and how to thank someone, for example), the math language of language fell apart. It just couldn’t be applied universally correctly. So when we returned to New York I looked up what this might be and found myself, well, confused. The closest example that I could find (which may or may not be what Taimi was referring to) was in a Keith Devlin column from 1996. He used an example from X-bar theory. (Doesn’t X-bar sound like a drinking establishment? In fact, there is such a place in Los Angeles, although it looks geared more towards Gen X than mathematicians). As an example a noun phrase (NP) would be something like “the fabulous gray cat” where the is the specifier and fabulous gray cat is N’. Another noun phrase is “the food bowl” where the is a specifier and food bowl is N’. From this you can form a verb phrase (VP) “sees the food bowl”. Here the V’ is just the single verb sees but it’s followed by the noun phrase the food bowl. In other words, VP→(specifier)V’NP*. This is where the recursive part comes in, using Y phrases to build X phrases. Presumably the next step would be to combine “the fabulous gray cat” and “sees the food bowl” into an actual sentence, but building sentences involves a whole other set of rules. In many ways this reminds me of diagramming sentences, except that instead of starting with the sentence and breaking it down, the rules have to be developed in such a way that they can be described regardless of the actual sentence or even actual language. Because the beauty and complication of this is that all of the X-bar rules apply regardless of whether your noun phrase is “the fabulous gray cat” or “el gato gris fabuloso” or “η μυθική γκρίζα γάτα”.